Glen Campbell : 20 Greatest Hits CD (2003)Title: 20 Greatest Hits Artist: Glen Campbell Genre: Country|Country Duration: 70.50 mins Format: CD / Album Type: CD No. of Discs: 1 disc(s) Studio / Label: Prism UK Release Date: 29 Jan 2003. Eminem : The Marshall Mathers LP CD (2003)Title: The Marshall Mathers LP Artist: Eminem Genre: Rap/Hip Hop|Rap Duration: 77.10 mins Format: CD / Album Type: CD No. of Discs: 1 disc(s) Studio / Label: Polydor UK Release Date: 24 Mar 2003 Explicit Lyrics: Yes. 50 Cent : Get Rich Or Die Tryin' CD (2003)Title: Get Rich Or Die Tryin' Artist: 50 Cent Genre: Rap/Hip Hop|Rap Format: CD / Album Type: CD No. of Discs: 1 disc(s) Studio / Label: Universal Music UK Release Date: 06 Feb 2003. Of Discs: 1 disc(s) Studio / Label: Geffen UK Release Date: 21 Mar 1994. Disc 1 12 Blackhole 7.34 mins. Disc 1 11 Mutherfucker 2.05 mins. Disc 1 11 Mutherf__er 2.05 mins. Disc 1 10 Nitemare Hippy Girl 2.55 mins. Disc 2 4 Sunrise (Who Knows About Forever?). Disc 1 10 It's You 3.15 mins. Disc 1 8 Money in My Pocket (Plan B Mix) 3.38 mins. Disc 1 7 Lost Weekend 4.05 mins. Various Artists : Now That's What I Call Music! 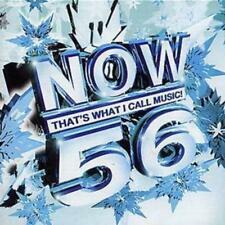 55 CD (2003)Title: Now That's What I Call Music! 55 Artist: Various Artists Genre: Rock/Pop|Compilation Duration: 149 mins Format: CD / Album Type: CD No. Various Artists : Smooth Jazz 2 CD (2003)Title: Smooth Jazz 2 Artist: Various Artists Genre: Jazz|Compilation Duration: 155 mins Format: CD / Album Type: CD No. of Discs: 2 disc(s) Studio / Label: Universal Music TV UK Release Date: 10 Mar 2003. Various Artists : Westwood CD (2003)Title: Westwood Artist: Various Artists Genre: Rap/Hip Hop|Compilation Duration: 152 mins Format: CD / Album Type: CD No. of Discs: 2 disc(s) Studio / Label: Universal Music TV UK Release Date: 03 Nov 2003. Of Discs: 2 disc(s) Studio / Label: Universal Music TV UK Release Date: 27 Oct 2003. Disc 1 5 Guitar Man 3.45 mins. Disc 2 5 My Best Friend's Girl 3.43 mins. Disc 2 17 Whirlpools End 7.11 mins. Disc 2 16 What It Is 4.55 mins. Orchestral Manoeuvres in the Dark : The Best of Orchestral Manoeuvres in theTitle: The Best of Orchestral Manoeuvres in the Dark Artist: Orchestral Manoeuvres in the Dark Genre: Rock/Pop|Electronic Duration: 74.10 mins Format: CD / Album Type: CD No. Sting : Sacred Love CD (2003)Title: Sacred Love Artist: Sting Genre: Rock/Pop|Singer/Songwriter Format: CD / Album Type: CD No. of Discs: 1 disc(s) Studio / Label: Polydor UK Release Date: 22 Sep 2003. Various Artists : Pop Party - Hits for Kids [includes Karaoke Cd] CD (2003)Title: Pop Party - Hits for Kids [includes Karaoke Cd] Artist: Various Artists Genre: Rock/Pop|Compilation Duration: 149 mins Format: CD / Album Type: CD No. Of Discs: 2 disc(s) Studio / Label: Virgin EMI Records UK Release Date: 05 Jun 2003 Explicit Lyrics: Yes. Disc 2 11 All Within My Hands. Disc 2 10 Purify. Disc 2 8 Sweet Amber. Disc 1 6 My World. Disc 1 5 Invisible Kid. John McSherry : At First Light CD (2003)Title: At First Light Artist: John McSherry Genre: Folk|Folk Duration: 43.20 mins Format: CD / Album Type: CD No. of Discs: 1 disc(s) Studio / Label: Vertical UK Release Date: 16 Jun 2003. The Police : Outlandos D'amour CD (2003)Title: Outlandos D'amour Artist: The Police Genre: Rock/Pop|Rock Duration: 38.20 mins Format: CD / Album Type: CD No. of Discs: 1 disc(s) Studio / Label: Polydor UK Release Date: 16 Jun 2003. Of Discs: 3 disc(s) Studio / Label: Classic FM UK Release Date: 13 Oct 2001. 1 6 Eclogue for piano and string orchestra - Finzi. 3 10 Prelude to Act 1 from "La traviata" - Verdi. 1 10 Elevazione for cello and oboe - Zipoli. Various Artists : Capital Gold Seventies Legends CD (2003)Title: Capital Gold Seventies Legends Artist: Various Artists Genre: Rock/Pop|Compilation Duration: 153 mins Format: CD / Album Type: CD No. Disc 2 12 Band of Gold 2.54 mins. Busted : A Present for Everyone CD (2003)Title: A Present for Everyone Artist: Busted Genre: Rock/Pop|Pop Duration: 54.30 mins Format: CD / Album Type: CD No. of Discs: 1 disc(s) Studio / Label: Island Records UK Release Date: 17 Nov 2003. Nat King Cole : Love Songs CD (2003)Title: Love Songs Artist: Nat King Cole Genre: Easy Listening|Easy Listening Duration: 74 mins Format: CD / Album Type: CD No. of Discs: 1 disc(s) Studio / Label: EMI Gold UK Release Date: 03 Feb 2003. Various Artists : Feelin' Good CD (2003)Title: Feelin' Good Artist: Various Artists Genre: Easy Listening|Compilation Duration: 127 mins Format: CD / Album Type: CD No. of Discs: 2 disc(s) Studio / Label: Universal Music TV UK Release Date: 28 Jul 2003. Darius : Dive In CD (2003)Title: Dive In Artist: Darius Genre: Rock/Pop|Pop Duration: 57 mins Format: CD / Album Type: CD No. of Discs: 1 disc(s) Studio / Label: Virgin EMI Records UK Release Date: 24 Feb 2003. Dave Gahan : Paper Monsters CD (2003)Title: Paper Monsters Artist: Dave Gahan Genre: Rock/Pop|Rock Duration: 48.10 mins Format: CD / Album Type: CD No. of Discs: 1 disc(s) Studio / Label: Mute UK Release Date: 02 Jun 2003. Blur : Think Tank CD (2003)Title: Think Tank Artist: Blur Genre: Rock/Pop|Indie/Alternative Duration: 56.04 mins Format: CD / Album Type: CD No. of Discs: 1 disc(s) Studio / Label: Food UK Release Date: 05 May 2003. Animals' Greatest Hits CD (2003)Title: Animals' Greatest Hits Genre: General|tbc Duration: 67 mins Format: CD / Album Type: CD No. of Discs: 1 disc(s) Studio / Label: Prism UK Release Date: 28 Apr 2003. Five Live Yardbirds CD (2003)Title: Five Live Yardbirds Genre: General|tbc Duration: 56.40 mins Format: CD / Album Type: CD No. of Discs: 1 disc(s) Studio / Label: Prism UK Release Date: 28 Apr 2003. Of Discs: 1 disc(s) Studio / Label: Virgin EMI Records UK Release Date: 02 Jun 2003. Disc 1 18 Finish 0.11 mins. Disc 1 16 Miami 4.18 mins. Disc 1 15 Oye 4.02 mins. Disc 1 14 F What A Ni a Say. 3.16 mins. Nick Cave and the Bad Seeds : Murder Ballads CD (2003)Title: Murder Ballads Artist: Nick Cave and the Bad Seeds Genre: Rock/Pop|Indie/Alternative Duration: 58.50 mins Format: CD / Album Type: CD No. of Discs: 1 disc(s) Studio / Label: Mute UK Release Date: 23 Jun 2003. Las Vegas Legends CD (2003)Title: Las Vegas Legends Genre: General|tbc Duration: 137 mins Format: CD / Album Type: CD No. 2 23 These Boots Are Made For Walking - Nancy Sinatra. 2 22 Walk On By - Dionne Warwick. Various Artists : Capital Gold: Reggae Classics CD (2003)Title: Capital Gold: Reggae Classics Artist: Various Artists Genre: Reggae|Compilation Duration: 152 mins Format: CD / Album Type: CD No. of Discs: 2 disc(s) Studio / Label: Universal Music TV UK Release Date: 11 Aug 2003. Dwele : Subject CD (2003)Title: Subject Artist: Dwele Genre: Rap/Hip Hop|Hip Hop Duration: 60.20 mins Format: CD / Album Type: CD No. of Discs: 1 disc(s) Studio / Label: Virgin Records UK Release Date: 19 May 2003. Siouxsie and the Banshees : The Seven Year Itch CD (2008)Title: The Seven Year Itch Artist: Siouxsie and the Banshees Genre: Rock/Pop|Punk/New Wave Duration: 74.40 mins Format: CD / Album Type: CD No. Of Discs: 1 disc(s) Studio / Label: Circa UK Release Date: 01 Dec 2003. Disc 1 9 The Spring 3.50 mins. Disc 1 12 Life and Death (Extended Mix) 8.36 mins. Disc 1 11 She's a Rainbow 4.19 mins. Disc 1 10 The Storm 3.50 mins. House of Love : The House of Love CD (2003)Title: The House of Love Artist: House of Love Genre: Rock/Pop|Indie/Alternative Duration: 45.40 mins Format: CD / Album Type: CD No. of Discs: 1 disc(s) Studio / Label: Spectrum UK Release Date: 30 Jun 2003. Various Artists : Original Eighties Album CD (2003)Title: Original Eighties Album Artist: Various Artists Genre: Rock/Pop|Compilation Duration: 73.30 mins Format: CD / Album Type: CD No. of Discs: 1 disc(s) Studio / Label: EMI Gold UK Release Date: 19 May 2003. The Night We Called It A Day. Film Soundtrack. Compact Disc. 2003. Australia.